This is the ultimate contrast-the old omnibus and the tiny car. I too think The Northumberland Arms is a fine name for a pub. Woah! 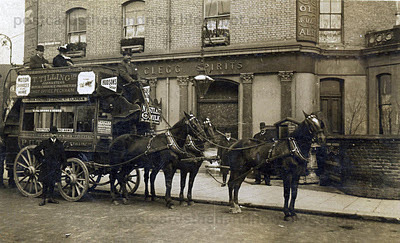 How I'd love to board the old horse omnibus! Somehow I think I'd rather have a ride on the horse-drawn carriage, even with its solid wooden wheels, than try to squeeze into the back seat of that red thing. I'm glad to see the buolding much as it was. Great postcard and again such amazing detail! Love all the adverts on the 'bus'. Wouldn't it be nice to step back in time, step inside, and take a drink in there. I'm glad to see the building and its existence as a pub continue, but these 'new' names are so ridiculous! What a great card! Are those passengers on top? Great view with great detail. It's fun to read the advertising. What are we coming to - an English pub with Thai dining? They wouldn't put up with that nonsense in Northumberland! I shall have to check out Tilling's Horse Omnibuses - this is a fine picture. The old view is far more interesting and the pub looks to have so much more character. It's surprising how different the pub looks even though it's only the result of a coat of paint. The flowerboxes in the upper windows would be a nice feature to restore in London again. I have often wondered about the use and purpose of the upper floors in buildings. Evn though the ground floors may have busy shops, the next levels are often ghosts of former activities.